Mrs C Website easy to use and order from. Bike competitively priced. Arrived in no time, properly packed and in mint condition. I'm enjoying using the bike daily. I will heartily recommend this website and have already been doing so. 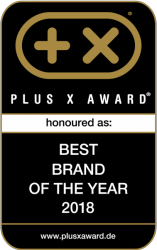 Thank you Fitshop. 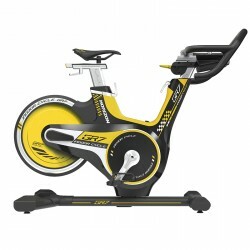 BodyMax B2 indoor cycle Arrived quickly and easy to assemble. Nice and sturdy and doesn't take up too much room. Easy to adjust the resistance. Small print on the digital display isn't very easy to read but really good workout. Would recommend. Indoor cycle The indoor cycle is great. My teenage children and I enjoyed assembling it. It looks very beautiful and takes up very little space which is great for our house. We ride it often. You can change the tension on the pedals to make it tougher to cycle. We haven't quite figured out how the monito works though. I'd recommend to anyone looking for something to use at home or part of a home gym. Great bike! I bought this bike because I do a lot of bike training at the gym but I don't always have time to go. It's easy to move around and incredibly sturdy - great quality too. It took me about 45 minutes to assemble and was pretty straight forward. Definitely glad I purchased this bike!! Indoor cycles were developped by cyclists in the 1970s. They looked for a possibility to do regular training sessions independent of wind, weather, and time. 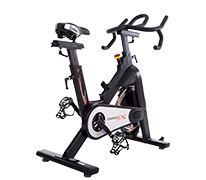 Indoor cycles offer everyone the possibility - either cyclist, athlete or leisure sportsman - to do a cardio training effectively. You can lose weight, improve your fitness, strengthen your cardiovascular system or increase your performance with an indoor cycle. Nowadays almost all gyms offer classes with the indoor cycle. In a group and with loud music you get motivated for new maximum performances. Those who like it more quiet, the indoor cycle at home is definitely the better alternative – at home you can choose your own music and tv programme. 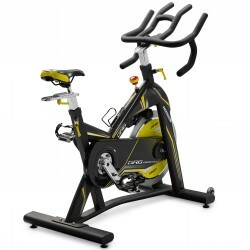 We explain to you what you should pay attention to purchasing an indoor cycle. It's the heart of every indoor cycle: the balance mass. It should be of a rather high weight, because a high balance mass is decisive for a smooth concentric run. 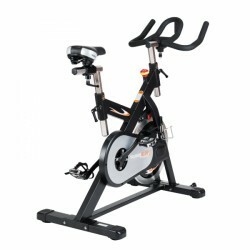 The smoothness of a concentric run of an indoor cycle also depends upon the workmanship of the indoor cycle and the type of brake system. 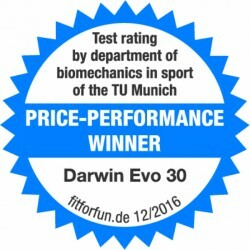 We recommend you models from a balance mass of 18 kg. The most common and most well-known type of brake of an indoor cycle is the felt brake. A metal plate covered with felt is pressed against the flywheel and generates the brake effect. By means of a control knob the pressure of the brake is increased and the training resistance gets increased as well. There are also the magnetic brake systems. Here, a strong magnet brakes the flywheel, the resistance is set by means of a control knob. The advantage of this version is that the magnetic brake system has no direct contact to the flywheel and works thus completely friction-free, silent, and maintenance-free. The drive is responsible for power transmission from pedals to flywheel. Like bicycles, some indoor cycles are still driven with the classic (metal) chain. The disadvantage is that it is much louder while exercising. 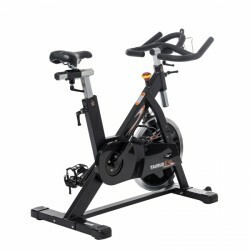 The main part of indoor cycles produced nowadays is designed for home use and the developers have the target to produce machines as silent as possible. Thus the most indoor cycles are driven by drive belts made of synthetics or Kevlar. These work silently and are maintenance-low. 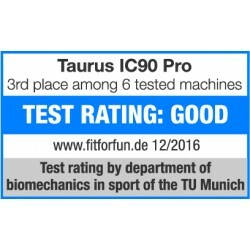 The company Taurus uses Kevlar belts, i. e., for their premium products like the Taurus IC70 Pro and the IC90 Pro. These belts are produced by the company Hutchinson in France and stand for first-class quality. 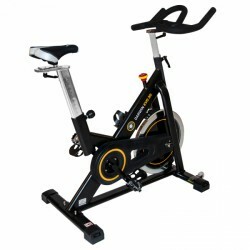 Your indoor cycle should be equipped with a sporty saddle, which supports you optimally in a dynamic cardio training. The handlebar should offer different grip positions, so that your training is varied and you can find the appropriate hand position on the handlebar. Make sure that the handlebar is very stable and non-slip, so that sweaty hands do not slip off and so you can get off the saddle while exercising. Saddle and handlebar of your indoor cycle should offer you the possibility to change your position in vertical and horizontal position. Many models have quick release locks, which allow you to do your adjustment quickly and easily. An infinitely variable adjustment is ideal, because you can adjust the indoor cycle even better to your height. 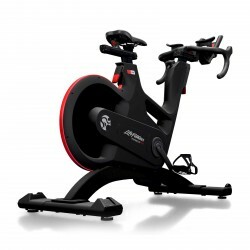 Take a look at the pedals when you buy your indoor cycle - in order to be able to do an ideal power transmission on the pedals. The foot should find a safe stand in the (basket) pedals, so that slipping off is avoided. The safe hold in the pedals is an extremely important aspect, because indoor cycles do not have freewheel. That means: the axis is stiffly connected to the crank. If you pedal backwards, i. e., the flywheel would rotate in the other direction as well. As already mentioned at the beginning, indoor cycles were invented by cycling pros. It's still proven even after many years of the invention. 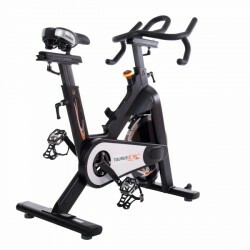 The pedals and the saddle can be easily exchanged, so that you can equip your indoor cycle, i. e., with click pedals or your racing bike saddle. These are the same standard threads and holders like for trecking or racing bikes. The most indoor cycles are equipped with transport wheels. These should be on the feet below the balance mass in any case. 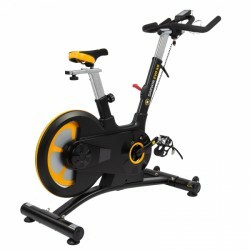 So you can easily move the indoor cycle to the desired place without much effort. 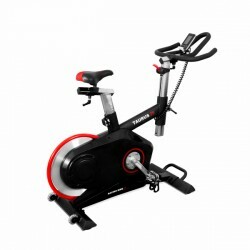 As further accessory we recommend you a training computer, which calculates important data, i. e., time, distance, speed, RPM, total distance as well as calories and heart rate in combination with an appropriate chest strap.